Camille sends out Pangolin to prepare the world for the Sky Overlord. The rangers must seek out the Jungle Mace in order to defeat Pangolin. Unfortunately Master Phant has left Pai Zhuq and no longer wants to help. Lily still has faith that the old master is still inside of the hermit. Touched by her hope, the master teachers her his techniques of the elephant. Well we had such a decent run of very good episodes that it was inevitable we were to get a lousy one before long. The episode starts off promising enough with the Power Rangers already locked in battle with the Pangolin and I think that’s part of this episode’s problem; after that the whole episode just comes to a slow crawl that doesn’t pick up to the end making it feel longer than the 22 minute run time of the episode. This episode introduces the first of the Spirit Rangers who will grow in importance over the course of the series. It’s just a shame that it is Phant; one of the most miserable characters the show has ever seen. Honestly, he reminds me of a number of grouchy Disney characters like Scrooge McDuck in Duck Tales who gets Huey, Duey and Louie knocking on his door. It takes an attack on Lily to change his mind when he sees her fighting ability and I can’t see why that would change his mind. Sure she has proven she is good fighter but that’s it. Other than that she behaves more like a stubborn child the whole time she is with him and I just feel that this would only annoy him even more when his place of solitude is attacked because Dai Shi’s forces are drawn there by the Power Rangers – I think. It’s not actually explained how they knew the rangers would be there. They just show up and attack as a plot point to get Phant to help them. So yet again a new weapon is added to the arsenal of the Jungle Fury rangers; the Jungle Mace. It’s a ball and chain that can break through steel as RJ tells them and is the only weapon that can defeat the Pangolin’s armour. Yeah because guns, swords and laser beams won’t work but a steel cutter will? RJ’s description of its power actually undermines its effectiveness. Why didn’t he simply say that it could break through any armour rather than mention steel specifically which although is strong is hardly titanium. It’s not exactly a difficult weapon to learn either as Lily picks it up in seconds even to the point where she can go “fishing” for the Pangolin when he drills down a hole although how it latches on to the Pangolin is anyone’s guess. Maybe it is sticky too? The new master theme follows through to Dai Shi as well as we learn that he is to be trained by Carnisoar the first of the three Overlords. 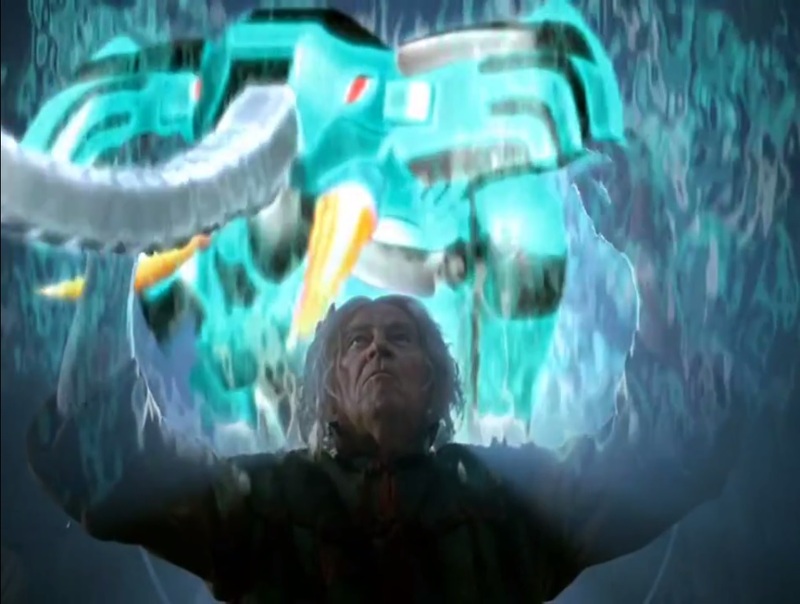 In this instance he is the Sky Overlord possesing the spirit of the Hawk but we don’t see him in the episode and the scene where he tells Camille he wants to be mentored by him is brief. Nevertheless it is little touches like this that are the reason I enjoy Jungle Fury so much as they make the whole series feel bigger than a series of single stories like a lot of previous incarnations. It’s not enough to save this episode for me though.